Wine: Wine is sold separately for $20 per bottle. This is a fun and easy 2-hour class of guided instructions to help create your very own mug. It is beginner level with no previous experience required and you will use various clay hand-building techniques to craft a true one-of-a-kind piece of pottery. All pieces will be dishwasher and microwave safe. The workshop fee includes all materials, clay, glazes and firing, tools and equipment as well as munchies. Cape Breton Centre for Craft & Design. Use the rear door on the Esplanade entrance. Please arrive 15 minutes early to get settled and grab your wine before your experience begins. Please enter by the rear entrance located on the Esplanade. You can pre-purchase a bottle of wine in advance through EventBrite when you buy your ticket. We suggest you, your friends, or tablemates purchase a bottle for the table, with sharing in mind. By purchasing your wine when you buy your ticket it will ensure you get the wine type you want. Yes, this a 19+ event. You may be required to present your ID. We recommend wearing comfortable, casual clothes that you do not mind getting clay on. Though most of the clay will easily wash out of your clothing, there are some clays and materials that may permanently stain. Many students choose to wear an apron or smock to help keep themselves clean. If you are coming straight from work we suggest you bring a change of clothes. What are my transport/parking options getting to and from the event? Please remember alcohol will be served at this event, so you may want leave your vehicle at home and take a taxi. What are the numbers for a Taxi Service in Sydney? I purchased a ticket for mug of the month, but now I can’t attend. Can I get refund? No, all ticket sales are final. However, you can sell or give your ticket to someone else – just let them know the details and please notify the organizer. When should I pick up my mug? Most work will be ready for pick up two weeks later. We’ll dry and fire your artwork in our kiln for you to take home approximately 14 days later and we will send you an email as soon as your mug has been fired and is ready to drink in! Kiln clay explosions are unlikely but they do happen. 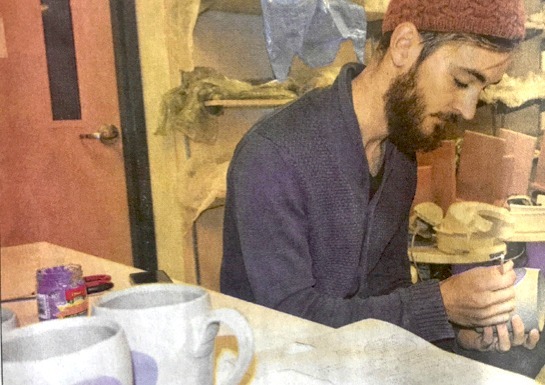 In the event of your art being damaged due to a kiln explosion, we are happy to provide emotional support and offer you a chance to come in and remake your clay art piece. Students are reminded to sign their work. Otherwise, we cannot promise your work won’t be mixed up with someone else’s. Almost everybody suffers from dryness of skin after working with clay. Creams and lotions after working are recommended. Also wash your hands thoroughly when you are done. Cape Breton Centre for Craft & Design reserves the right to use photographic material for advertising and promotional purposes. If you do not want to be photographed, please let us know in advance. Trevor Novak from Ontario is a maker of mainly sculptural ceramic objects. He is interested in narrative and myth and enjoys bringing stories to life with the figure. He often tackles grim and uncomfortable subject matter but is equally intrigued by humour and the lighter sides of life. Trevor is simply trying to figure out life in a world that he can’t even begin to comprehend. Check Trevor out here https://www.youtube.com/watch?v=YsU854hxsOw or follow him on https://www.instagram.com/trevornvk/. * The minimum amount of participants for Mug of the Month is 8. Cape Breton Centre for Craft & Design reserves the right to cancel the event if the minimum amount of participants is not met.